A recent flurry of articles and website postings have been made to indicate that the fable of Jesus is mentioned in the Vedas [Bhavisya Purana]. Many Vaisnavas have been enthused [confused] by these Vedic findings, confirming Jesus as a messenger of God [Krsna] and a pure devotee. However, a closer look at the prediction of Jesus found in the Bhavisya Purana strongly suggests foul play or interpolation on the part of Christian Missionaries in India during the late 18th century. Although the Bhavisya Purana is certainly a bona-fide literature, its predictions concerning certain events cannot be taken as absolute because of evangelical interference. The Bhavisya Purana is considered to be one of the major 18 Puranas of the Vedic canon. 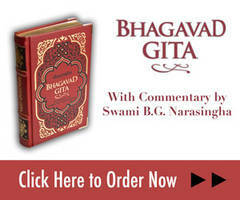 As the name suggests, it mainly deals with future events (bhaviysati). The Bhavisya Purana is also mentioned in the ancient text of the Apastambha-dharma-sutras, so it is to be taken as an original Puranic literature dating from the time of Vyasadeva. However, there are four known editions of the Bhavisya Purana, each having different predictions from the other, but suspiciously having one consistent prediction - that of Jesus. One edition contains five chapters, one contains four, another contains three and yet another contains only two. Additionally, the contents in all four editions differ in various degrees - some having extra verses and some having less. Due to these circumstances, it is difficult to ascertain which of the four is the original text of the Bhavisya Purana, if indeed an original text still exists, but suspiciously all four editions do mention Jesus. The Venkateswar Steam Press edition of the Bhavisya Purana printed in Bombay in 1829 (and reprinted by Nag Publishers in 2003) is probably the most complete version available, containing all the main features of the four manuscripts. Since none of the four editions of the Bhavisya Purana predate British Rule in India, this further suggests a discrepancy, plus the fact that all four versions mention Jesus. After Salivahana defeated the Sakas he established his empire, thus the Salivahana period of Indian history began, circa 78 CE. According to this apparently interpolated section of the Bhavisya Purana, at some point after establishing his kingdom, Salivahana traveled to the Himalayas and met Jesus. Yet Christian scholars opine that Jesus was born in 4 BCE and was crucified somewhere between 27 and 36 CE. If we entertain the idea that Christ somehow survived the crucifixion and met Salivahana in the Himalayas, this would make him around 80 years old at that time. Yet surprisingly, the description of Jesus in the Bhavisya Purana does not mention that he was an old man. The idea common amongst Christians that Jesus was born of a virgin only came into existence several centuries after Jesus and was not part of early Christianity. Thus, it is unlikely that Jesus would have spoken of his birth as such. "Behold, a virgin has conceived and bears a son and she will call his name Immanuel." The Hebrew word for virgin is 'betulah' yet it appears nowhere in this verse of Isaiah. The word used is 'almah' which simply means 'a young woman'. Isaiah only uses 'almah' once. However, the word 'Betulah' is used five times throughout the Book of Isaiah, so Isaiah obviously made a distinction between these two words. Nowhere in the Gospels do we find in the ministry of Jesus the above teachings to his followers. Furthermore, in this passage, Jesus is advocating the worship of the Sun-god (again, something that is absent in his instructions to the apostles). Japa, meditation, the negation of both good and bad karma, are all concepts that are familiar to eastern religions such as Hinduism and Buddhism, but not to the Abrahamic religions of the west. Considering the above anomalies and the fact that no edition of the Bhavisya Purana can be found prior to the British period in India, we can only deduce that the Bhavisya Purana was tampered with by the Christian missionaries who added the chapter on Jesus. Their motive is obvious - to make the personality of Jesus acceptable to the Hindus, in order to convert them to Christianity. In 1784, the famous Indologist Sir William Jones wrote the following letter to Sir Warren Hastings, Governor General of India, confirming our suspicions. "As to the general extension of our pure faith in Hindoostan there are at present many sad obstacles to it... We may assure ourselves, that Hindoos will never be converted by any mission from the church of Rome, or from any other church; and the only human mode, perhaps, of causing so great a revolution, will be to translate into Sanscrit... such chapters of the Prophets, particularly of ISAIAH, as are indisputably evangelical, together with one of the gospels, and a plain prefatory discourse, containing full evidence of the very distant ages, in which the predictions themselves, and the history of the Divine Person (Jesus) is predicted, were severally made public and then quietly to disperse the work among the well-educated natives." (Asiatic Researches Vol. 1. Published 1979, pages 234-235. First published 1788). It may also be noted that throughout the Pratisarga-parva of the Bhavisya Purana we find the stories of Adam and Eve (Adhama and Havyavati), Noah (Nyuha), Moses (Musa), and other Biblical characters. These we also consider to be added by zealous Christians. In conclusion, the Bhavisya Purana may well be a genuine Vedic scripture prophesying future events, but from the above analysis we can say with certainty that the Jesus episode of the Bhavisya Purana is not an authentic Vedic revelation.